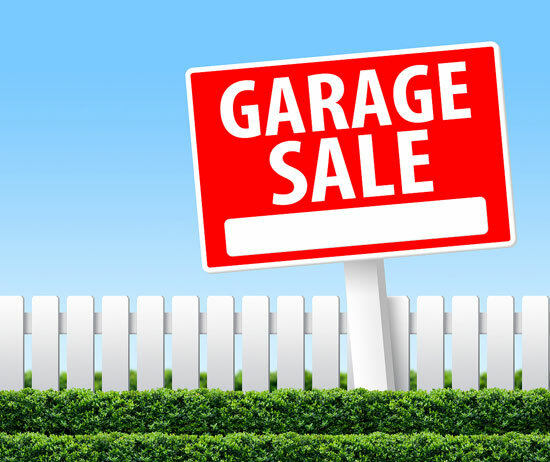 You don’t want to be scrambling to hold a garage sale the week before an open house. Depending on how long you’ve lived in the home and how much stuff you have to sell, planning a garage sale can demand a lot of time and energy. Most municipalities will require you to obtain a special permit or license in order to hold a garage sale. The permits are often free or very inexpensive, but still require you to register with the city. You can turn your garage sale into a block-wide event and lure more shoppers if you team up with neighbors. However, a permit may be necessary for each home owner, even if it’s a group event. Sales on Saturdays and Sundays will generate the most traffic, especially if the weather cooperates. Start the sale early, 8 a.m. or 9 a.m. is best, and be prepared for early birds. Place an ad in free classified papers and Web sites, and in your local newspapers. Include the dates, time, and address. Let the public know if certain types of items will be sold, such as baby clothes, furniture, or weightlifting equipment. On the day of the sale, balloons and signs with prominent arrows will help to grab the attention of passersby. Lay out everything that you plan to sell, and attach prices with removable stickers. Remember, garage sales are supposed to be bargains, so try to be objective as you set prices. Assign simple prices to your goods: 50 cents, 3 for $1, $5, $10, etc. If it’s really junk, don’t sell it. Make sure that items you want to keep don’t accidentally end up in the garage sale pile. Lay out your items by category, and display neatly so customers don’t have to dig through boxes. It helps to keep all electronic items on one table, all kitchen appliances on another, dishware and cooking items on another, and so on. Stock up on bags and newspapers. People who buy many small items will appreciate a bag to carry their goods. Newspapers are handy for wrapping fragile items. Make a trip to the bank to get ample change for your cashbox. Throughout the sale, keep a close eye on your cash; never leave the cashbox unattended. It’s smart to have one person who manages the money throughout the day, keeping a tally of what was purchased and for how much. Keep a calculator nearby. Prepare for your home sale. Donate the remaining stuff or sell it to a resale shop. Now that all of your clutter is cleared out, it’s time to focus on preparing your house for a successful sale!